Much has already been written about the link arrows that iTunes 4.5 displays next to each song in your library. To recap: click an arrow to go to relevant songs in the iTunes Music Store; Option-click an arrow to go to relevant songs in your local library. The Option-key trick is all well and good, but many iTunes users are after a more-permanent solution. The always-excellent Mac OS X Hints site publicized one such solution yesterday: opening Terminal and pecking in a command that reverses the way the link arrows work: Option-click to search the music store, click to drill into your local library. That got me to thinking. How about an AppleScript that would allow you to toggle the link arrow behavior? I mentioned this to a much-smarter-than-I-am colleague, Jonathan Q. Woolson, and he wrote the following scripts. Download iTunes Arrow Scripts (36K StuffIt archive). This archive contains two scripts: "Set iTunes Arrows to Local" and "Set iTunes Arrows to Music Store." You can run them right from the Finder, or you can install them in the iTunes Scripts menu to be able to toggle iTunes' behavior from within the program itself. To do the latter, stash them in Library > iTunes > Scripts. Me-commerce department. These scripts -- and more, including a collection of the best of Doug's AppleScripts for iTunes -- are on the DVD that comes with my book, The Macintosh iLife '04. Almost 300 full-color pages, every one of them updated for iLife '04. A two-hour instructional DVD that dovetails with the book and also contains GarageBand loops, sample projects, and utilities and plug-ins for all five iLife programs. All for the insane price of $20.99 at Amazon.com. Option-click the link arrows. Those commerce-oriented link arrows that now appear for all songs in your library? Option-click on one, iTunes switches into browse mode and displays relevant songs in your library. This isn't a secret, but it's nice! Yes, kids, sharing has changed. On Macintouch, a college student complains that shared libraries appear grey. There's a reason for that. Solution: Upgrade everyone to 4.5. But note that certain music pilfering utilities will no longer work. The Library changes. iTunes 4.5 updates your iTunes Music Library file, renaming the original to "iTunes 4 Music Library (Old)". Apple documents this in a tech note. Snap Me Back. In iTunes 4.5, the LCD -- which is what Apple officially calls that long, round-cornered area in the top center of the iTunes window -- has a new control, a small, curved arrow that appears when you're playing a song. It's called the SnapBack arrow, and clicking it has the same effect as choosing File > Show Current Song always has: it selects the song you're listening to. Use it (or the Command-L keyboard shortcut) after you've been pawing through your library and you want to get back to the song you're hearing so you can add it to a playlist. More from Apple. Linking to an iMix. Want to email an iMix link to a friend or publish it on your Web site? Control-click on the icon for your iMix, then choose Copy iTunes Music Store URL from the shortcut menu. Paste that link into an email or the Web tool of your choice. Rate my iMix. I've been so busy writing about iTunes 4.5, I've had time to publish only one iMix. But check it out and rate it! Be gentle. Heid on "Your Mac Life" again. Last night, I spent a fun 20 minutes talking about iTunes 4.5 on Shawn King's terrific "Your Mac Life" radio show. To listen to the archive, paste the following link into your QuickTime Player's Open URL dialog box: rtsp://qt.yourmaclife.com/yml/YML040428s.mov. To skip to my segment, drag the slider until the time read-out says roughly 01:34:30. More shameless me-commerce. Everything you've read here in the last two days -- and a whole lot more -- is in The Macintosh iLife '04, the new edition of my book and two-hour instructional DVD combo. The book ships to the printer this week, and you can pre-order your copy now for the next-to-free price of $20.99. While the world downloads iTunes 4.5 and starts publishing iMix playlists, Apple has quietly released iMovie 4.0.1. The update fixes some serious bugs, including the hideously unusable Ken Burns zoom-outs that I reported on here last week. Can I get a hoo-ray? Get the update, but heed Apple's warning about installing it: "You must have iMovie 4.0 installed in its original location to update to iMovie 4.0.1. If you do not have iMovie 4.0, or if you have moved it from its original location, the updater will not work." It's a good day to be iLive. iTunes 4.5 is here. Apple has delivered a new latest version of its music jukebox software, and the new release brings enhancements big and small. I've had the opportunity to work extensively with iTunes 4.5 -- there's exhaustive coverage of the new version in the The Macintosh iLife '04, the new edition of my book and two-hour instructional DVD combo. The book is going to the printer this week, and you can pre-order your copy now. To hold you over until it arrives, here's a detailed look at iTunes 4.5 and some excerpts from the book. iTunes 4.5 looks and works almost identically to previous versions. But look closely at your library or playlists, and you'll see little right-pointing arrows next to each song, artist, and album name. Click one of these arrows, and you're taken to the relevant area of the iTunes Music Store. This is a swell way to quickly locate and buy music that relates to tunes you already have. It will also be a swell way to herd iTunes users to the music store. You don't have to participate if you don't want to: to hide the link arrows, choose Preferences from the iTunes menu, and uncheck the box labeled Show Links to Music Store. While Microsoft has been blathering about "closed ecosystems", the iTunes Music Store has become the most successful online music store. Many of the enhancements in iTunes 4.5 are aimed at holding that lead. Here's what's new. iMix playlist publishing. You've crafted a killer playlist? Share it with the rest of us. Just click the little right-pointing arrow next to the playlist's name, and you can publish your playlist on the iTunes Music Store for all the world (or at least some of it) to see. A published playlist is called an iMix, and it appears in its own screen, much like an artist or album page. With the "Tell a Friend" button, you can let people know about your published playlists, and they can preview its songs -- and, Apple hopes, buy them. iMix playlist publishing is simply a way to share your tastes with other shoppers, and it adds a welcome element of community to the iTunes Music Store. With published playlists, you aren't just seeing songs that Apple and record labels are pushing -- you're seeing ones that other music lovers are recommending. I'm a big believer in carefully crafted playlists, and I look forward to seeing what people come up with. And to rating them. Previews in playlists. In iTunes 4.5, you can drag a song preview from the music store into a playlist -- it's just like adding a song from your music library. This can be a handy way to put together a temporary shopping list -- drag previews into a playlist, then go back and review them again before deciding what to buy. You can also publish a wish list of tunes: Drag previews into a playlist, then publish the playlist. Your friends won't be able to buy the tunes for you -- the music store's copy-protection system prohibits that -- but they could buy you gift certificates. Hint, hint. And because someone out there just asked: if you burn a playlist containing previews, iTunes simply skips over the previews. Radio charts. Interested to know what the hot songs are in your town? Me neither. But for folks who are, the new Radio Charts feature should be popular. It lists the top songs from hundreds of cities and over 1000 radio stations, and will be updated monthly. UPDATE: I've had a chance to play with this feature (it wasn't active in the pre-release versions of iTunes that I used), and I'm changing my tune. It's cool! A very diverse array of stations are represented -- we aren't talking just Soft Rock Hits for Soccer Moms here -- and it's fun to travel around the country and sample what folks are listening to. One free tune each week. Each week, the music store will provide one free download of its choosing. I'm looking forward to this, but I hope Apple offers songs from a variety of genres. More music videos. The music store will have more music videos as well as movie trailers with links to related soundtrack albums and audiobooks. For golden-eared audiophiles, the best news in iTunes 4.5 is a new way to encode music from CDs. In addition to the AAC and MP3 formats, you can now encode using the new Apple Lossless encoder. True to its name, the Apple Lossless encoder (AL) delivers sound quality that's identical to the original CD. MP3 and AAC, by comparison, are lossy compression schemes -- like the JPEG image format, they reduce file size by compromising quality somewhat. Lossless encoding is not new. File-archiving programs such as StuffIt perform lossless encoding every time they compress a file. In the audio world, lossless encoders such as FLAC (short for Free Lossless Audio Codec) have become popular among audiophiles and thinkers different. But lossless encoding hasn't been part of iTunes until now. Because lossless encoding doesn't mangle audio the way lossy encoding does, your encoded files aren't nearly as small as AAC or MP3 versions would be. According to Apple, tracks encoded with AL will be about half the size of their uncompressed equivalents. I conducted some informal tests with a pre-release version of iTunes 4.5, and found that, as you might expect, the amount of compression you get varies significantly depending on the music. As you can see, file sizes are still hefty with AL. I'm not planning to re-rip my CD collection any time soon, but I know people who are, and it's smart of Apple to address them in this release. New QuickTime required. In order to use Apple Lossless, you need to upgrade to QuickTime 6.5.1; the update is included with the iTunes 4.5 download. Latest iPods only. Songs encoded with AL will play on any iPod with a dock connector (including the iPod mini), though you'll need to update your iPod software to the new 2.2 version. They won't play on earlier iPods. iTunes 4.5's new Party Shuffle playlist lets you quickly throw together a mix of songs. It's an interesting hybrid of random shuffle mode, smart playlists, and conventional playlists. To use Party Shuffle, click its icon in the Source list of the iTunes window. iTunes instantly assembles a list of songs from your library, weighing its selection toward songs to which you've assigned higher ratings. 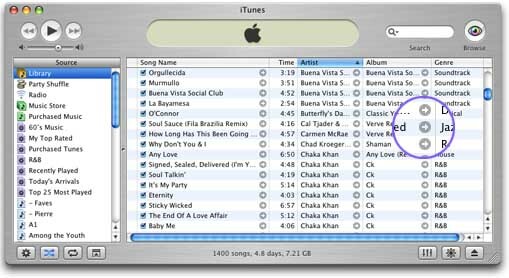 By using the Source pop-up menu at the bottom of the Party Shuffle playlist, you can specify that iTunes narrow its pool of eligible songs to specific playlists -- handy if, for example, you don't want any classical tracks in your mix. What's the difference between Party Shuffle and iTunes' ordinary shuffle mode? Control. With shuffle mode, you don't know what iTunes is going to play next. With Party Shuffle, you get a list of the songs that iTunes has chosen. Don't like what iTunes has come up with? Click the Refresh button, and iTunes comes up with another set of songs. Slot machine meets jukebox. You can also change the list on a song-by-song basis, just as you can with other playlists: drag songs up or down to change their playback order, delete songs you don't want to hear, even manually add songs from your iTunes library. And if you like what Party Shuffle comes up with, you can freeze it into a conventional playlist: choose Select All, then choose New Playlist from Selection. Party Shuffle takes the serendipitous discovery of shuffle mode and combines it with the control of a conventional playlist. It's a fun new way to explore and present your music library. 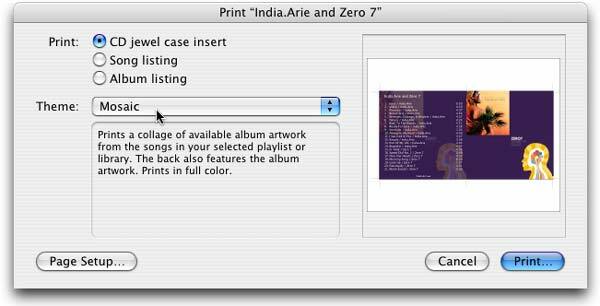 For the first time, iTunes has a Print command: you can now print jewel case inserts and song lists. To print a jewel case insert for a playlist that you've just burned, select the playlist and choose Print. In the Print dialog box, click the CD Jewel Case Insert button, then choose from any of several design themes. iTunes 4.5's printing features take advantage of the album artwork feature that debuted in iTunes 4. If your playlist's songs have corresponding album art, iTunes 4.5 uses the art for the front and back of the case insert. If the playlist contains songs and art from more than one artist, you can choose one of the Mosaic themes, and iTunes makes a collage of the album art. The results are gorgeous. You can also print several types of song and album lists. They're a great way to produce a hard-copy reference of your music library and favorite playlists. Finally, a few odds and ends. Multiple library support. If you use Panther's fast user switching feature, you'll be glad to know that iTunes 4.5 also supports it. Each user can now have his or her own music library. DRM changes and network sharing. Apple has made changes to some of iTunes' digital rights management underpinnings, and these changes affect network music sharing. If you use iTunes' sharing features, you need to install version 4.5 on all your computers. More rights, fewer rights. In iTunes 4.5, you can authorize up to five Macs or Windows computers to play your purchased music -- up from three. But Apple giveth and Apple taketh away: you can now burn a playlist containing purchased music up to seven times (down from ten). And the old workaround of simply changing the playlist slightly does not work. More preferences. In the Preferences dialog box, you can choose to show or hide not only the music store linking arrows, but also the Party Shuffle playlist and the Radio list. iTunes 4.5 brings something for everybody. The new music store features will help Apple maintain its lead in this embryonic but important race. Lossless encoding satisfies those golden-eared types who cringe at the sound of AAC or MP3. And the Party Shuffle playlist and new printing features are just plain cool. I'll have more tips on iTunes 4.5 in the days to come. As I mentioned, I explore the depths of iTunes 4.5 -- and of all five iLife '04 programs -- in the new edition of my book. The Macintosh iLife '04 is the brand-new version of the original Mac digital hub book. One reviewer called it "the best computer book ever, bar none", and the new edition is the best yet. Almost 300 full-color pages, every one of them updated for iLife '04. A two-hour instructional DVD that dovetails with the book and also contains GarageBand loops, sample projects, and utilities and plug-ins for all five iLife programs. All for the insane price of $20.99 at Amazon.com. Talking iLife on "Your Mac Life"
Yesterday evening, I was a guest on Shawn King's "Your Mac Life." We talked about iMovie plug-ins -- the subject of my latest Digital Hub column in Macworld magazine. To jump to my segment, fast-forward until QuickTime Player's counter reads approximately 01:17:50. You can also get to the archive by going to the show's archive page. On Apple's iDVD discussion boards, a user writes: "I have several 8x11.5" posters (text & graphics) that were created in MS Word (Office X) that I would like to include in an iDVD project as a slideshow. Any advice as to how I might convert these documents to images?" Well, that sounded like a challenge to me. Turns out the solution is simple. 2. Choose Page Setup from File menu and choose landscape orientation (sideways -- to match the orientation of the slide show). 3. Print to a PDF (in Panther, choose Save as PDF in the Print dialog box). Preview your DVD, and you should see the page appear as a slide. Note that small text is likely to be difficult to read on a TV screen. You'll get the best results with docs that contain font sizes above 14 point. And use the Show TV Safe Area command (Advanced menu) to make sure nothing gets cut off. Also, this tip works best if each poster is a single MS Word document. For multipage Word documents, you have to save each page to a separate PDF. Although the original question dealt with Word, I suspect this would work very well with other types of Office documents, including PowerPoint slides. It's almost here! The next edition of the top-selling iLife book is going to press soon. Almost 300 full-color pages, every page revised for iLife '04, and an all-new, two-hour instructional DVD. Pre-order The Macintosh iLife '04 for $20.99 (30 percent off). There seems to be a problem with the Ken Burns effect in iMovie 4: If you zoom out on a photo, the resulting move is often very awkward: the zoom-out begins very slowly, then very rapidly ramps up. The move is not at all what iMovie displays in its preview monitor. This problem is particularly noticeable in short clips -- a few seconds long, for example. It's ugly and makes zooming out pert-near unusable. But where there's a will, there's a workaround: Rather than zooming out on a photo, zoom in. Then, select the resulting clip and choose the Advanced menu's Reverse Clip Direction command. You'll get a much smoother zoom-out. Chatting About eBay Tonight -- Join In! Tonight, I'll be participating in an online chat at the World without Borders site. No, tonight's chat isn't about iLife. It's about eBay -- specifically, about selling on eBay. I haven't mentioned here that much, but I recently coauthored a book on eBay selling with my friend and business partner Toby Malina. Sell It on eBay is a roadmap to successful online auctions. Its design is very similar to that of my iLife book -- a full color, innovatively designed book that tells you exactly what you need to know to clean out your attic and make a few bucks in the process. Oh, and set the TiVo -- Toby will be appearing on TechTV's Call for Help this Wednesday to talk about eBay. We're regulars on the show, usually making an appearance every month or so. What's an iLife guy doing co-authoring a book about eBay selling? It's simple. Selling on eBay lets me satisfy my addiction for digital cameras.